If skiing on pristine powder gets you going, imagine taking a helicopter from the deck of a megayacht direct to the mountain. The charter yacht Legend is offering heli-skiing excursions in April along Greenland’s west coast—on a per-cabin basis, too. As she’s done in the past, Legend is hosting EYOS Expeditions guides onboard for the journey. With abundant experience in the country, these guides will take you and other guests on a variety of adventures. For example, you can go snowmobiling, hiking, dogsledding, and even cruising in Legend’s Zodiac inflatables and other tenders to go whale-watching. If you’re extra adventurous, you can go with a guide in the megayacht’s personal sub, diving down 1,000 feet to check out Greenland’s sea life. While the latter is an additional charge on top of the €25,000-per-person rate (about $28,500 at press time), your stay does include the best of what the 253-foot (77-meter) megayacht has to offer. Legend puts a spa at your disposal, where you can get a massage. As is practice with more traditional yacht charters, the rate additionally includes all your meals and beverages. Furthermore, it includes your heli-skiing trips—starting on Legend’s aft-deck helipad—and apres-ski soaks in the hot tub. A maximum of 14 guests can go heli-skiing. However, the yacht can accommodate a total of 26 guests. Regardless, it should be a memorable experience. Per-cabin trips are rare, but not unheard of, in yachting. 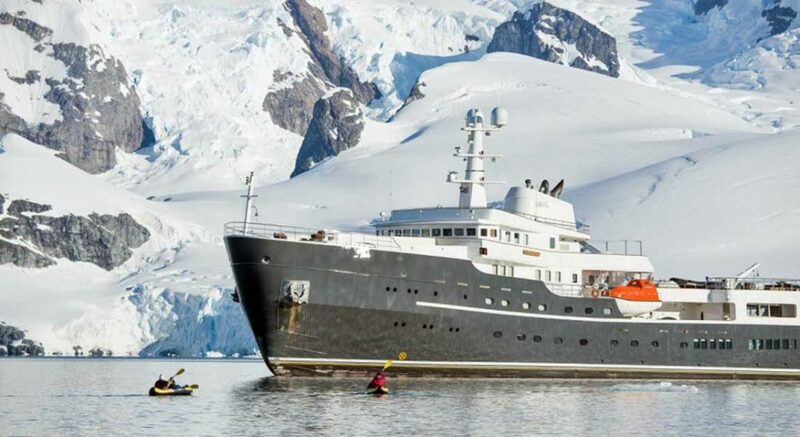 Last year, in fact, Legend and EYOS announced single-cabin Antarctica charters occurring this season. Two expeditions took place earlier this month, too. Ben Lyons, CEO of EYOS, explains, “Based on the tremendous success of those expeditions, we are excited to partner once again with Legend and offer a similar experience.” He adds that it’s ideal for small groups of friends who want the advantages of megayacht charters without having to book the entire yacht (and incur the related cost). The heli-skiing adventures start April 19 and run through April 26. The departure port is Nuuk, the capital and largest city in Greenland. The last port is Kangerlussuag, renowned as home to Russell Glacier. Email the Legend and EYOS team for reservations and information.